Menorca Mar Charter SL (“The Owner”), whose address for the purpose of communication, is C/ Gerifalte 122 Cp 28232 Las Rozas de Madrid with CIF B8758083, provides informational content about its activities on its website www.barcosenmenorca.com. These general conditions govern only and exclusively the use of the owner’s website by the users who access it. These general conditions are provided to users through the website solivent.es on each and every page so that users are fully informed and can read, print, file, and accept through the internet. Access to the website of the owner implies without reservation the acceptance of the present general conditions of use and the confirmation of complete understanding by the user. The user agrees to not use the website and the services offered in it for the performance of activities contrary to the law and to respect at all times these general conditions. FIRST – Conditions of access and use 1.1- The use of the owner’s website of the owner does not require the registration of the user. The conditions of access and use of the present website, strictly governed by current legislation and by the principle of good faith, commit the user to proper use of the website. All acts that violate the legality, rights or interests of third parties: the right of privacy, protection of data, intellectual property, etc. are strictly prohibited. Specifically, the owner prohibits the following: 1.1.1- actions that may produce on the website or through it by any means, any types of damage to the systems of the owner or third parties. 1.1.2- the distribution without authorization of any type of advertising or commercial information directly or covertly, sending mass mailings (“spamming”) or sending large messages in order to block servers from the network (“Mail bombing”). 1.2- the owner may terminate access to the website at any time if there is detection of illegal use, or use contrary to good faith or these general conditions- see clause five. SECOND – Contents – The incorporated contents in this website have been developed and included by: 2.1- the owner using internal and external sources in such a way that the owner is only responsible for the contents developed internally. 2.2- The owner reserves the right to modify at any moment the existing contents on the website. The owner does not assure nor is responsible for the proper functioning of links to third-party websites that appear on solivent.es. In addition, through the website of the owner, free and paid services offered by third parties are made available to the user and will be governed by the particular conditions of each of them. The owner does not guarantee the veracity, accuracy or timeliness of the contents and services offered by third-parties and is expressly exempt from any type of liability for damages that may arise from the lack of accuracy of these contents and services. THIRD – Responsibility 3.1- The owner in no case is responsible for: 3.1.1- the failures and incidents that may occur in communication, or deleted or incomplete transmissions, so that there is no guarantee that the services of the website are constantly operative. 3.1.2- of the production of any type of damage that the users or third parties could cause on the website. 3.1.3- of the reliability and truthfulness of the information introduced by third parties on the website, either directly or through links. Likewise, Menorca Mar Charter SL will collaborate and notify the competent authority of these incidents at the moment in which it has reliable knowledge that the damages caused constitute any type of illegal activity. 3.2 The owner reserves the right to suspend access without prior notice at its discretion either permanently or temporarily until the effective responsibility of the damages that may occur is established. Likewise, the owner will collaborate and notify the competent authority of these incidents at the moment in which he has reliable knowledge that the damages caused constitute any type of illegal activity. FOURTH – Copyright and Trademark – Menorca Mar Charter SL is a registered trademark. 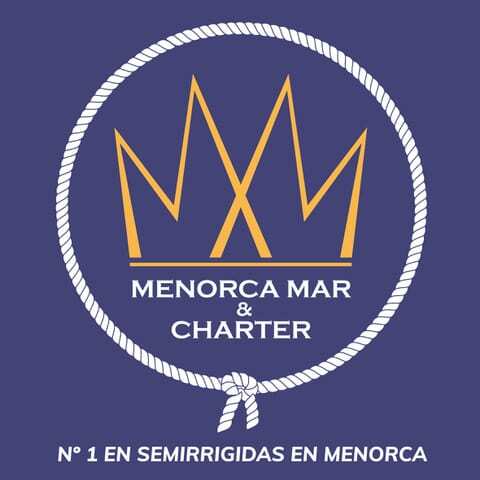 The use of others by any means of the Menorca Mar Charter brand, which includes both the name and the logo, is expressly forbidden, except with the express consent of the owner. All rights reserved. In addition, the website of Menorca Mar Charter including its own contents, programming and website design, is fully protected by copyright. Any reproduction, communication, distribution and transformation of the said protected elements is expressly prohibited without express consent from the owner. FIFTH – Jurisdiction and Applicable Laws – The present general conditions are governed by Spanish legislation. The courts of Madrid will resolve any dispute or conflict arising out of these general conditions. The user expressly renounces any other jurisdiction. SIXTH – In the event that any clause of this document is declared void, the other clauses will remain in force and will be interpreted taking into account the will of the parties and the purpose of these conditions. GENERAL CONDITIONS OF USE OF THE WEBSITE menorcamarcharter.com. The owner may not exercise any of the rights and powers conferred in this document which imply the waiver of the same unless this waiver is expressly recognized by the owner. In accordance with the organic law of 15/1999, of December 13, for the protection of Personal Data, you are informed and give consent so that the data supplied to this website is saved and processed in a file owned by Menorca Mar Charter SL. The personal data provided may be used only for the relations between our company and the user of this website. We do not release the data to third parties for advertising purposes. You can exercise the rights of access, rectification, cancellation, and opposition of the data provided in the terms established in the current legislation.